Ishigaki boasts one of the highest encounter rate of manta ray in the world, and many divers visit the island in order to watch the breathtaking dance of this elegant creature. Although mantas are around Ishigaki all year round, it is not that they are swimming everywhere in the ocean nor you can see them always. Rather, they are often seen at certain “points” around Ishigaki – i.e., Manta City and Manta Scramble of Kabira, Kuroshima, Panari, and Yonara Channel. The most famous one is “Manta Scramble”, located on the northwest side of Ishigaki island. This diving point consists of mountainous reefs. Mantas come to some of those reefs called cleaning station, where small cleaning fish eat the bugs on mantas’ skin and clean them. While being cleaned by the cleaner fish, mantas hover around the cleaning station slowly, sometimes for more than 30min, before swimming away. While Manta Scramble is a rather wide mountainous area, Manta City, located around 300m west of Manta Scramble, is a much smaller reef with a cleaning station in the middle. 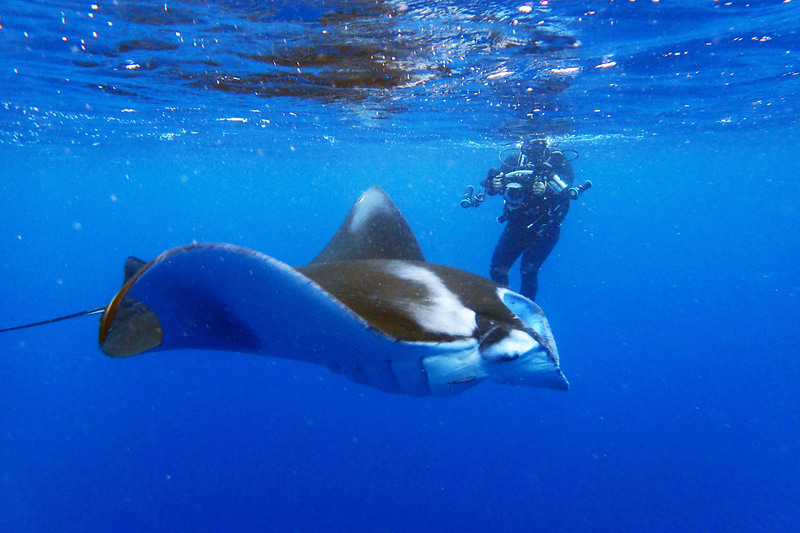 Manta City was found years after Manta Scramble, and is now more popular as manta encounter rate is higher these days. As Manta City is a much smaller dive point, only five diving boats are allowed to be anchored at any time. Kabira area is not accessible during north wind. As the wind usually blow from the north during winter, diving around Kabira area is not available during winter, although there are some exceptional days. During winter many mantas come to around Kuroshima, a small island located around 20km southwest from Ishigaki port, with population of only 220. Winter north wind will be blocked by Ishigaki and Taketomi islands, and the sea condition around Kuroshima is generally calm in winter. 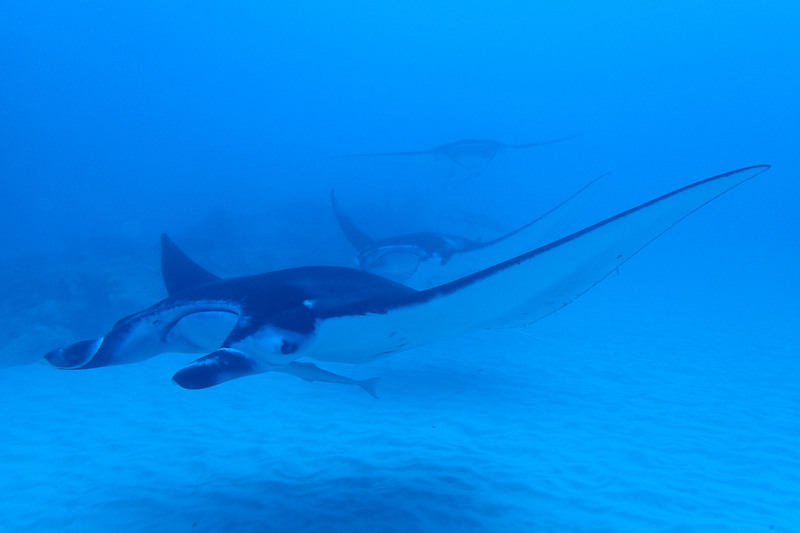 Mantas visit Kuroshima area during November through March to feed on planktons. While mantas swim and hover around cleaning stations around Kabira manta points area, there is no specific “point” that mantas gather around here. Mantas swim around the water surface with their big mouth wide open to scoop the planktons around the surface. As they often just come and go, encounter rate is probably around 50%. Mantas also come around Panari island, just on the west of Kuroshima. This area is exposed to the open water of the Philippine Sea, and generally choppy in condition, but mantas are often seen around spring in relatively shallow reef area. 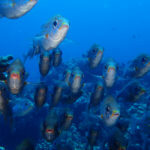 There is another manta point, available only for experienced divers – Yonara Channel. 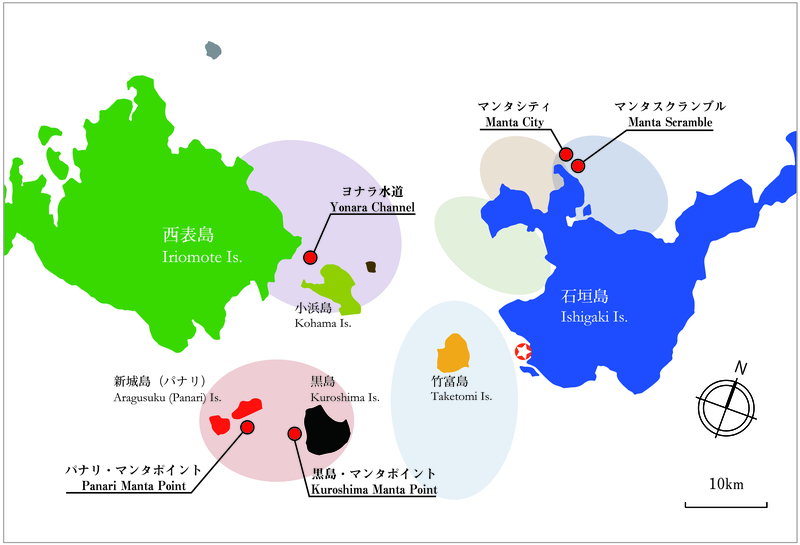 Yonara Channel is located around 18km west from Ishigaki, between Kohama and Iriomote islands. It is one of the few drift diving point around Ishigaki, and the best timing for diving is ebb (lowering) tide. The point is 25-30m deep, and there is nothing in between the water surface and the bottom white sand, other than the blue water. When you reach the bottom, there often are big ones such as mantas, spotted sting rays, guitar sharks, etc. 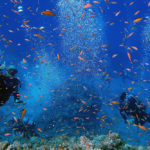 Although is deep/drift dive and your dive time will be limited to only around 25min, the breathtaking dance show of the big ones is something any diver want to see once in a life time.